Horizontal spray drying equipment finished all processing in compact drying box, for the atomization of materials, dehydration, drying, powder delivery and bag dust removal ; Small area, internal easy cleaning and small heat losing, the unique exhaust heat recovery system can significantly reduce energy consumption, improve the comprehensive utilization of heat. 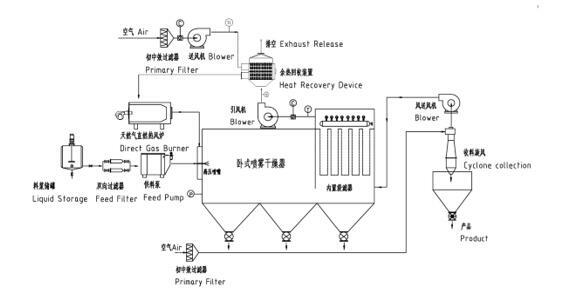 Horizontal spray drying equipment with exhaust heat recovery system can improve energy consumption and utilization of heat equipment. Chemical industry: white carbon black, concrete admixture, barium sulfate, basic chromium sulfate, alumina, titanium oxide, kaolin, ferrite, block talc, carbides, fertilizers, dyes, detergents, ACR additives, latex, Water purification agent, resin, plastic, cryolite and so on. Food industry: dextrin, maltose, protein powder, egg yolk powder, oligosaccharides, granular fat, instant coffee, starch, spices, fruit and vegetable stars. 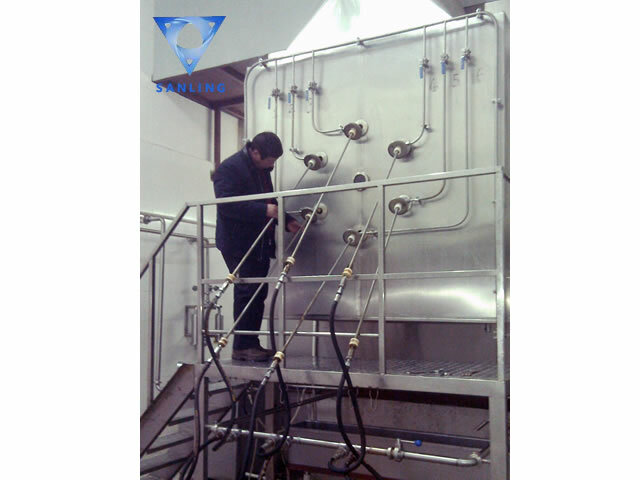 Dairy industry: skimmed milk powder, whole milk powder, soy milk powder, ice cream powder, milk powder, cool acid sodium. Pharmaceutical industry: Chinese and Western medicine powder, antibiotics, biochemical products, vitamins, pesticide powder, hydrolyzed protein, enzymes, single-cell protein.